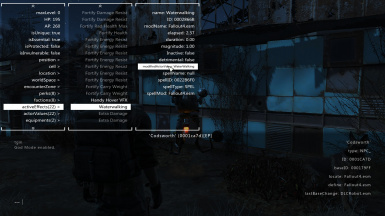 This is a F4SE plugin which makes console menu show extra useful infomation about selected target,for example, target's name, ID, baseID, mod name and so on.This plugin also add some extra info lists to console to show selected actor's all kinds of info like factions, perks, active effects, actor values, equipments and so on. - Added support for game version v1.10.64. - Made this plugin version indepedent. - Fixed some unsafe multi-thread codes which maybe cause CTD on loading. - Added support for game version v1.10.50. - Added support for game version v1.10.40. - Added support for runtime v1.10.26. - Fixed a minor memleak. - Changed hotkey of extra info list from SHIFT to CTRL to avoid conflict when type upper char with pressing SHIFT.If you prefer SHITF as hotkey,you can still use console.swf form old version. 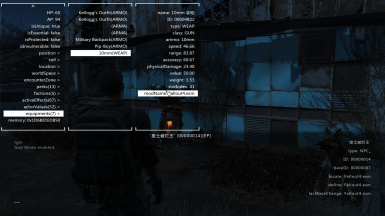 This is a F4SE plugin which makes console menu show some extra useful infomation about selected target,for example, target's name, ID, baseID, mod name and so on.This plugin also add some extra info lists to console menu to show selected actor's all kinds of info like factions, perks, active effects, actor values, equipments and so on.For more details you can view the pictures. Show selected target's name, ID, base ID, name of mod which defines this form or edits this form. You can press CTRL key to show extra info lists to display selected actor's all kinds of info like HP, AP, flags, cell, location, world space, encounter zone, factions, perks, active effects, actor values, equipments and so on. 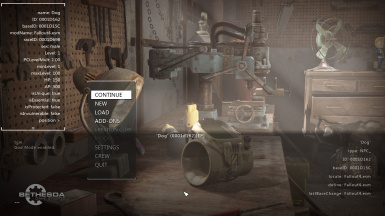 This mod will conflict with other mods which edit or replace Console.swf too.Please make sure that Console.swf from this mod overwrites all other files if exist. 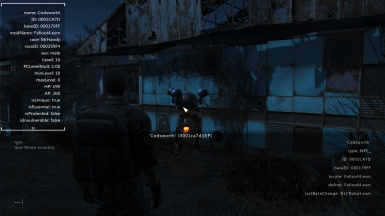 Fallout4 V1.10.26, V1.10.20 or V1.9.4. 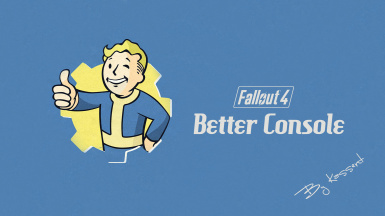 Fallout 4 Script Extender (F4SE) V0.4.2 or above. HUD Plus Plus: Adds some UI widgets to HUD to display detailed information of object crosshair points to or selected in quick loot menu. Floating Damage: Show floating damage number when someone is hit. 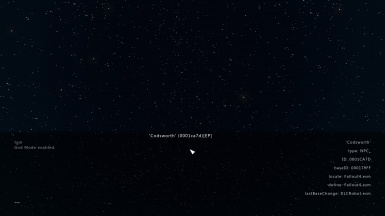 Unlimited Survival Mode - F4SE: Enable console and remove all kinds of restrictions in survival mode. 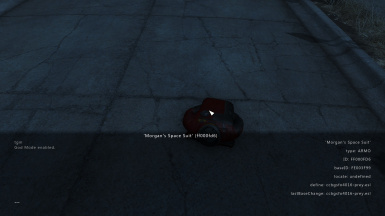 Unlimited Fast Travel - F4SE: Enable fast travel from interior, remove all kinds of restrictions on fast travel. Clock Widget: Show real time while loading. expired6978 for his source codes of LooksMenu.